Vol. 15, no. 15 (May 3, 1900)-v. 45, no. 52 (Feb. 6, 1930). In its various incarnations, the Democrat served the needs of the people of Valentine and Cherry County in north-central Nebraska. Previous titles include the Democratic Blade (1885-89), the Cherry County Gazette (1889-92), and the Cherry County Independent (1892-97). The paper first took the name Valentine Democrat in 1896 under the editorship of Robert Good. 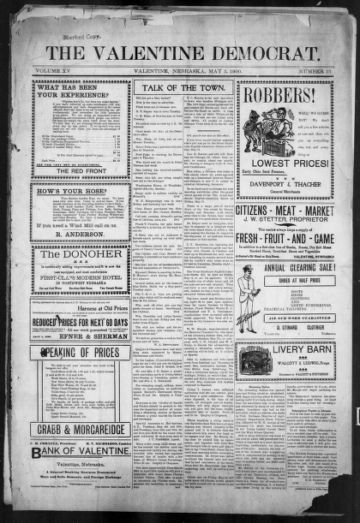 On September 1, 1898, Good changed the title to the Western News-Democrat, which it kept until May 3, 1900, when Isaac M. Rice took over as editor and publisher and renamed it the Valentine Democrat. Annual subscriptions were $2.00 for the Valentine Democrat and just $1.00 for the Western News-Democrat. Rice continued as editor until 1911, and the Democrat maintained its title until 1930, when it was superseded by the Cherry County News. Editions of the Democrat typically ran four to five columns on each of its eight pages. Hoping to forward the region's economic prosperity, the Democrat emphasized issues important to the largely agricultural community. During his tenure as editor, Good published the cattle brands of more stockmen than any other newspaper in Nebraska, often devoting two or more pages to illustrate the brands in a given issue. Though the various titles' mastheads were largely simple, their subheadings were often more informative. Through "A News, Farm and Stock Journal," the Western News-Democrat provided tips on threshing buckwheat, cutting corn, and housekeeping, and maintained a vigilant eye on livestock and agricultural prices. After Rice took over as editor, noticeable changes followed. The Valentine Democrat's new subheading boasted that it was the "Official Newspaper of Cherry County," likely in an attempt to bolster advertising funds. Additionally, the earlier focus on livestock and agriculture started to give way to a greater emphasis on political reform. Under both Good and Rice, the Democrat followed closely the life and politics of presidential candidate and reformer William Jennings Bryan. On February 8, 1900, the paper went so far as to incorporate Bryan's personal motto—"No question is ever settled until it is settled right"—as a subheading. Beginning on July 18, 1901, each issue provided extracts from Bryan's own paper, The Commoner. The Democrat also covered broader political, social, and economic issues of the Progressive Era, incorporating political cartoons and reprinting national and international news articles. Rice introduced his readers to a larger, global system of events, while not losing sight of local and state developments. Combining the ideals of both the Democrats and the Populists, the Valentine Democrat encouraged participation in local and national Democratic Party efforts as well as supporting electoral fusion in Nebraska, in which multiple parties would endorse the same candidate on a ticket.